Q. How can I get the header to change with each section of my document? A. First, make sure you have used Section Breaks before the title of each section. These are on the Page Layout>Page Setup>Breaks button. 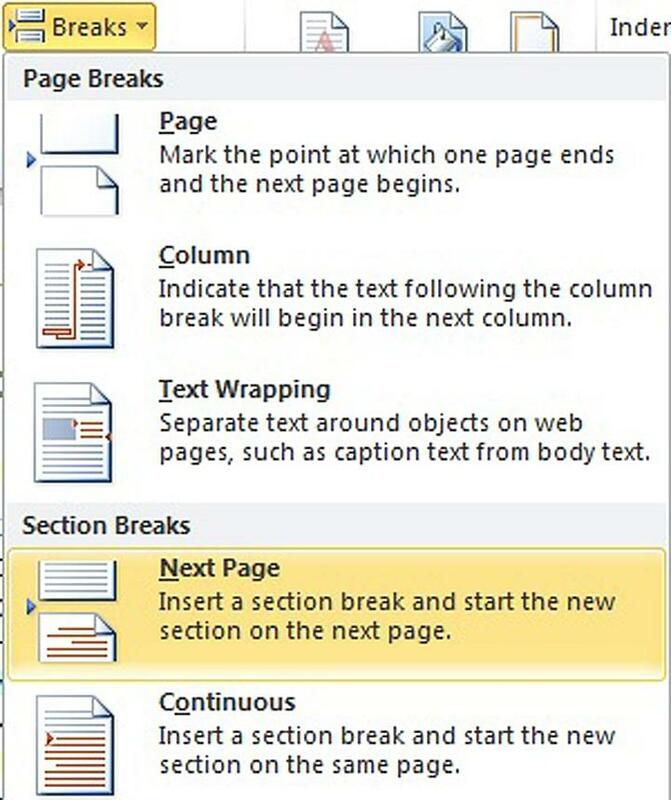 Choose from Section Break selections in the dropdown menu. Next Page will probably give you the right results. Double-click into the Header. Click Pre­­vious until you are in the first header in your document. Create your first header and then the Next button (Header & Footer Tools Design>Navigation>Next). This navigates to each section header. Click the Link to Previous button, so there is no longer an orange highlight (toggled-off). Con­­tinue until you have all your section headers just the way you like them. Q. How do I get sequential page numbers at the bottom of each page? A. There are a couple of ways to do this. Double-click into the footer of your document. The Header & Footer Tools Design tab will appear. On the far left in the Header & Footer group, you’ll see the Page Number button. Click it and choose Bottom of Page. Pick either option 1, 2 or 3 depending upon the desired placement (left, middle, right). If this is something you do often, you can right-click the Page Number button and add it to your Quick Access Toolbar. You don’t even have to be in the Header or Footer to use it! Just click it, and choose the placement and page number type you want. Q. I don’t like where my pages are breaking. How can I fix it without using manual page breaks? A. When titles separate from paragraphs or diagrams or only a few lines of a large paragraph end up on the next page, it can give your document a messy look. Select all the text and objects you want to keep together. Right-click and choose the Paragraph dialog box. On the Line and Page Breaks tab, confirm that you checked Widow/Orphan control. Then, also check Keep with next and Keep lines together. If that doesn’t solve the problem, try Page break before on the first line of the text.